We had enchiladas for dinner this past Friday night and they were awesome for three reasons: first, they were very easy to make (in fact, they could be called "throw them together while daddy gives the girls a bath enchiladas"); second, they were so good; and third, they taught me a very powerful lesson. I never thought enchiladas to be emotional, really, but this week they were for me. It all started when I decided to try a new recipe for Chicken Enchiladas, a recipe whose author calls it her go to dish to take to new moms. Since I was making dinner for a new mom this week and still hadn't decided what I was going to make, I figured it was a good enough sign that her version of Chicken Enchiladas was a sure bet. 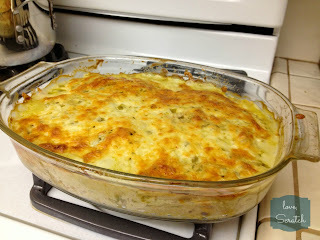 Why I hadn't thought to bring Chicken Enchiladas to this new mom before this week escapes me. My Grandma's Creamy Chicken Enchiladas are something of a legend on my mom's side of the family, and she made them hundreds of times over the years, I'm sure, for just about any reason or occasion you could think of: for holidays, birthdays, and other family gatherings; for potlucks and funerals and people who needed a little extra help around the house; and she would even make them just because. Her enchiladas were her go to dish, and walking in to dinner at grandma's house was always extra exciting when the smell of those enchiladas greeted us at the door. To purposely make different recipe for Chicken Enchiladas felt wrong to me, as if I was breaking some sort of family code by admitting that there could be another creamy chicken enchilada recipe out there that was worth making. But I did it anyway this week, and this recipe became very special to me very fast. It comes from Shauna Niequist's Bread and Wine, from the chapter called "Love and Enchiladas" in which she talks about the people who made up the house church she and her husband were part of several years ago now. When I read about her group and how they met on Wednesday nights for dinner in someone's home, and how week after week they developed a love for each other that became more like that shared among family than that shared among friends, I couldn't help but think about our own sort-of house church we had before we got married: a group of people who that filled that kitchen with laughter and wine and guacamole and and dirty dishes during what we used to call Family Night. Family Night is what got us through the week, it seemed. We would text back and forth early in the week, planning menus and deciding who was going to bring what. At 7:00, the door would start opening and we would buzz in and out of that warm yellow kitchen, circling around each other as we poured chips into bowls, popped things in and out of the oven, and crammed mismatching chairs around the kitchen table. As the night wore on, we would ask for seconds and refill glasses and play one more round of Hell's Pile or marvel at the wonder of who God is - and we would do it all for as long as we could keep our eyes open. It's been a few years since we've done that, now. Things changed, as things tend to do. Some of us got married; others moved away; babies were born; and jobs were lost and found. Life carried all of us in different directions, and along the way the connections that sustained us during those years started to get lost as we lived our new realities - each of us, in our own way - very much like what happened to that little House Church that ate these particular enchiladas all those times so far away in Michigan. Even though I was making this particular pan of enchiladas for a newer friend than the ones we shared Family Night with, all I could think about was how those nights would never come again, and feeling sad about that but still somehow happy that life took me where I am today. As I layered together tortillas and chicken and cheese, I thought about and prayed for Adam and Christy, and for Felicia and Kara and Jason and Jonathan and Stacy and Amy and Mike. All of them - I couldn't seem to help it. And then I started thinking about all the ways our lives have changed and all the new friends that have come into our lives since that time, some whom were going to receive that particular pan of enchiladas and some who were not. People who I enjoy and pray for and love in different ways than the friends who were part of Family Night. People who are new, but neither more nor less important, really. And I thought about the funny way that God answers prayer and the way that He never leaves us even when we lose the thing that we thought we could never live without, and how our needs are important to Him and He provides just what we need right when we need it. All this from a pan of enchiladas. So you see, these enchiladas are more than just enchiladas. They showed me that things I've known and loved for years are still important to me, they still hold powerful memories, and they retain their power to make me feel comfortable and cared for. But they also taught me that there is a place for change and for new and for doing things a little bit differently. Just because I love these enchiladas doesn't mean that my love for Grandma's version has diminished at all; it just means that I have discovered something new to love as well. And new isn't bad. New is just new, and I believe there is a lesson in that for me when it comes to change and growth in my life, and that's what makes these enchiladas so special. That's why I made them again Friday night. Because I wasn't quite ready to move on from the nostalgia I was feeling about those days before we were married, when Wednesday nights were Family Night and we would get our fill of good food and people who carried us through some of the toughest times we had faced yet. And you know what? The truth is I don't have to let go. Not really. I can hold on to the good from then and accept and enjoy the reality of what is now all at the same time. Those days are part of my history and your history and our history together, and if it weren't for them, and the people who filled those days to the brim with life and love and laughter, we wouldn't be who we are today, together. True to Shauna Niequists' thoughts in her book Bread and Wine, by the third time I made this recipe it became my own, in that I made it without looking at the recipe at all by then. I knew Joey loved it because he said so after the first bite and went back for seconds after he inhaled his first serving. My dad asked me if I had it written down somewhere because he wanted to make sure I made it again (and again and again). Make this once and I'm sure you'll feel the same way as our family does about Annette's Enchiladas. Mix together the first three ingredients and spoon about a half a cup of sauce or so into the bottom of a 9 x 13 baking dish, smoothing it into a thin layer that covers the entire base of the pan. Next, simmer the chicken broth and pass the tortillas through the broth one at a time as you build each layer. Create layers of tortillas, chicken, cheese and sauce by layering four tortillas on top of the base layer of sauce. Top with half of the chicken, a third of the cheese, and a third of the sauce. Repeat. Top the second layer with another four tortillas, the remaining third of the sauce, and the remaining cheese. Bake at 350 degrees for at least 30 minutes (but I baked mine for about an hour so that the cheese got a bit crispy and golden.) Let sit for 15 minutes before serving. I'm sorry I didn't taste them. You'll just have to make them again. : ) Grandma would be the first to cheer for an easier recipe - the easier, the better!